On the 1st of May we, eight birdwatchers from Stockholm, arrived in Riga by ferry from Stockholm for an intensive four days birding in Latvia 1-4 of May 2008. On the boat trip in the Gulf of Riga we saw our first 22 species for this trip. Worth mentioning - one Common Scoter (sjöorre) and two Little Gull (dvärgmås). We arriwed at Melnragi in the middle of the day. Here were two wet areas with a small number of birds. We decided to return early next morning. Very near the road to Sumragi we had our first Grey-headed Woodpecker (gråspett). At Sumragi there is a good spot for eagle and stork birding with a large birding-tower. With a good help of our experienced guide Janiz, we got a good view of both one Black Stork, (svart stork) and two Lesser Spotted Eagles (mindre skrikörn). At both Melnragi and Sumragi we saw around ten to twenty White Storks (vit stork) five Common Cranes (trana) and one Hobby (lärkfalk). After this short detour on the way to our main goal for the afternoon we continued on to the beginning of our search for the primary target bird group in the Kemeri National Park: woodpeckers; Janiz guided us along a 8 km long walk into the park. The woods were full of bird songs - even in the afternoon - with a good observation of White-backed Woodpecker (vitryggig hackspett) and we heard calling Three-toed Woodpecker (tretåig hackspett), Black Woodpecker (spillkråka) and Wryneck (göktyta) singing in nearby trees. Janiz also demonstrated the differences between the tracks of Wolf, Pine Marten and Wild Boar while in the next moment he pointed out a calling Hazelhen (järpe). In a stream, near the cars, some of us could see a rapid Common Kingfisher (kungsfiskare) fly away right after that Janiz heard it calling. In the next moment a Beaver was spotted in the same stream very near. We decided to return to this area next morning by ourselves, now that we know how find the way. We will meet Janiz again for a walk into the Livberze Forest, just south of Kemeri NP, tomorrow after-noon. Rather late we arrived to the castle of Jaunmoku pils where we stayed for the night. After a late dinner in the city of Tukums we had a singing Black Redstart (svart rödstjärt) on the top of our roof at the annex to the castle. Today - a rather early wakeup-call and many nice places to visit. The breakfast-packages were delivered and we were on the road by 04:40. First stop Melnragi with a whole lot more bird-activity than yesterday afternoon. Calling Grey-headed Woodpecker (gråspett) and Wryneck (göktyta) singing Savi’s Warblers (vassångare) and calling Water Rails (vattenrall) and Garganeys (årta) the latter also posing excellent. Then we headed for an early walk into the Kemeri NP, as yesterday evening. Now there were a lot more of singing species and some new ones also. 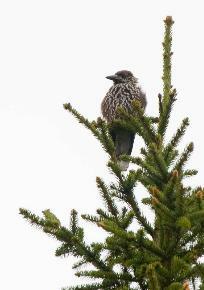 Amongst them an excellent view of Spotted Nutcracker (nötkråka). Other worth mentioning was a nearby drumming Three-toed Woodpecker (tretåig hackspett) and mating White-backed Woodpecker (vitryggig hackspett). A lonly Waxwing (sidensvans) was passing over. After the long walk we were headed for a second meeting with our guide Janiz, who now took us to Livberze Forest. The road was very bad the last km so we all took a walk to the trail into the unexploited forest with a lot of dead trees around. The walk produced only Middle Spotted Woodpecker (mellanspett) seen by a few. From the trail and back to the cars we had nice views of one Black Stork (svart stork) flying nearby, one Lesser Spotted Eagle (mindre skrikörn) and one White-backed Woodpecker (vitryggig hackspett). Rather exhausted we now turned our way more north and Engures Lake for an evening- glance near the bird-tower and the Bird Observatory, but before that we had a dinner in the village of Berziems. While waiting for the food to be served we heard a singing European Serin (gulhämpling) and a passing Merlin (stenfalk). At the lake we had numbers of Ruffs (brushane) and several of Spotted Redshank (svartsnäppa). A lot of Black Tern (svarttärna), Little Gull (dvärgmås), Red-necked Grebe (gråhakedopping) and two Great White Egrets (ägretthäger) along with Redshank (rödbena), one Black-tailed Godwit (rödspov) and Bittern (rördrom). Amongst the ducks there were three Pintail (stjärtand), 25 Wigeon (bläsand), five Garganey (årta), two Gadwall (snatterand) and at least ten Shoveler (skedand). Late in the evening we arrived at the guest house near Kozrag. Some of us could see a Woodcock, (morkulla) on his nightflight. 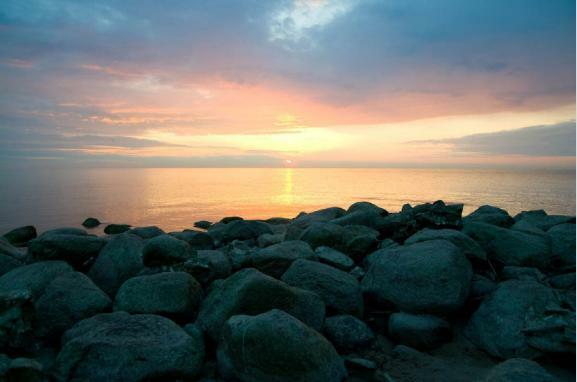 Early in the morning, around 05:00, we arrived at the cape of Kolka. A nice sunny day with a weak southeast wind - equals to not so much of migrating spring-birds. Some of the species we saw between 5.15 and 10 o´clock; 60 Red-throated Diver (smålom), 20 Black-throated Diver (storlom), 6 sp. Diver (obestämd lom), 1000 Long-tailed Duck (alfågel), 42 Velvet Scoters (svärta), 200 Common Scoter (sjöorre), 20 Merganser (småskrake), 3 Shelduck (gravand), 30 Eider (ejder), 30 Scaup (bergand), 40 Sparrowhawk (sparvhök), 1 male Hen Harrier (blå kärrhök), 2 Marsh Harrier (brun kärrhök), 6 Rough-legged Buzzard (fjällvråk), 2 Osprey (fiskgjuse), 1 Merlin (stenfalk), one pale- and one darkphase of Arctic Skua (labb), 7 Sandwich Tern (kentsk tärna), 2 Little Gull (dvärgmås), 2 Whimbrel (småspov), 11 Rook (råka), 300 Wood-Pigeon (ringduva), 1000 Brambling/Chaffinch (bo/bergfink), 500 Tree Pipit (trädpiplärka) and around 300 Siskins (grönsiska). A middle of a day-watch at Mazirbe we saw at least four soaring White Stork (vit stork) and one soaring Black Stork (svart stork). A few of us took a watch on the highest spot of the Kolka Peninsula and recorded one Red-breasted Flycatcher (mindre flugsnappare). Others took a look around the nearest surrounding of Kozrag and the guesthouse and saw one Woodlark (trädlärka) four Pied Avoset (skärfläcka), one White-tailed Eagle (havsörn) and a lot of Common Scoter (sjöorre) feeding near the shore, at least 2000. Early in the morning, around 05:00, we arrived to the Cape of Kolka. Almost the same weather-conditions as yesterday so we decided to spend more time on birdwatching on the way back to Riga this last day of our trip. Anyway, Kolka between 5.15 and 8 o´clock – some of the birds; One singing Black Redstart (svart rödstjärt) on top of a building near the parkingplace, 19 Red-throated Diver (smålom), 33 Black-throated Diver (storlom), 6 sp. Diver (obestämd lom), 17 Velvet Scoter (svärta), 45 Common Scoter (sjöorre), 13 Merganser (småskrake), 3 Shelduck, (gravand), 18 Eider (ejder), 10 Sparrowhawk (sparvhök), one male Marsh Harrier (brun kärrhök), 5 Rough-legged Buzzard (fjällvråk), one Arctic Skua (labb) and one Rook (råka). Between Cape Kolka and Roja we saw a female Capercaillie (tjäder) along the road at Roja/Kaltene Lunkakmens. Before lunch some of us took a short break in the north bird-tower at Engure Lake. One singing Great Reed-Warbler (trastsångare), three female Smew (salskrake) and five Red-necked Grebe (gråhakedopping). Around and after lunch we were gathered again near the bird-tower/Observatory at the east side of the lake Engure. 35 Ruff (brushane), 20 Spotted Redshank (svartsnäppa), 5 Black Tern (svarttärna), 10 Little Gull (dvärgmås), 15 Red-necked Grebe (gråhakedopping), 1 Great White Egret (ägretthäger) along with Redshank (rödbena), and one Bittern (rördrom). Amongst the ducks there were 1 Pintail (stjärtand), 3 Wigeon (bläsand), 10 Garganey (årta), 2 Gadwall (snatterand) and at least ten Shoveler (skedand). Just before heading Riga we saw one Lesser Spotted Eagle (mindre skrikörn) soaring over the woods and heard one Great Reed-Warbler (trastsångare) sing from the birdtower. A short stop on the way near the Engure on the shore to the sea there were two Little Tern (småtärna), one Black-tailed Godwit (rödspov), and one White Stork, vit stork. Now we were in great hurry for the ferry back to Stockholm.